While His Lordship, The Farve, basks in the adulation the Farve Channel—formally known as ESPN—gives him in buckets for beating his former team and "showing them he can still play," let's try to remember how we all got here and what actually happened. Allegedly, Farve is upset at Green Bay because they rejected him and felt he couldn’t play anymore. If memory serves—and it does, backed up by actual hard news—Green Bay wanted The Farve back. "I thought he was going to play," McCarthy said. "Last week was the first time, of all the conversations we've ever had, that the word retirement was ever spoken. He was consistent throughout. It was a personal decision. He was clearly wanted back. 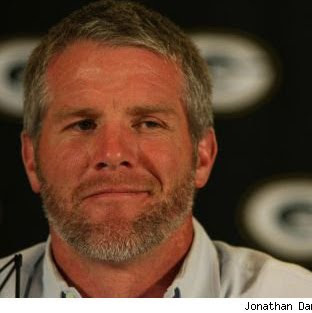 How could you not want Brett Favre's career to continue?" "I think we're all a little bit disappointed," Thompson. "But at the same time, we respect Brett's decision, and this was his decision.... All of a sudden it kind of hits you. It's like, Brett Favre is not going to be our quarterback any more." You see, the Packers wanted Brett Farve back. They spoke to him and tried to convince him to play another season. 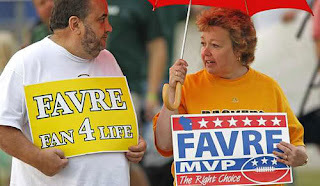 When Farve insisted he was retired, they moved on. When asked repeatedly by the press in Wisconsin, “Did the Packers try to convince Farve to stay?” here's what Thompson said. "He wants to know a couple of things: 'Do you still want me and can I still play?'" Thompson said. "Obviously both Mike and I were very positive in that regard and said definitely we do.... I just think it's a decision that he has constantly wrestled with in terms of trying to make the right decision and leave at the right time. And I believe he thinks this is the right time for him." I'd like to thank Mike McCarthy and Ted Thompson... And it's hard to leave. You think you're prepared for it. I know there's been comments and issues in the press lately about why I'm leaving, whether or not the Packers did enough, whether or not Ted and Mike tried to convince me to stay. None of those things have anything to do with me retiring, and that's from the heart. Once again, these are Farve’s words. “The team wants me back.” “None of those things have anything to do with me retiring.” It sounds like this is a grown man making his own decision. So, everyone knows what happened next. The Packers move on, prepare and train with Aaro n Rodgers as their quarterback. They draft 2 other quarterbacks to compete with Rodgers. They have two off-season mini-training camps with Rodgers leading the team. Rumors float around that Farve is itching to come back. Farve and his agent vehemently deny it. Then, on the eve of training camp, Farve tells them he wants to play, and he expects to start. The Packers say, Sorry, you swore you were retired. We have a team in place, we’ve moved on. Farve throws a hissy fit, tells Greta Van Sustern that the Packers “rushed him into retirement,” and later admits to ESPN that he wants to "get back" at Thompson. He wants to play for the Vikings so he can beat the Packers. ESPN's Gene Wojciechowski—well-known Farve shill—wrote this morning, "This one was for Ted Thompson. For Mark Murphy. For Mike McCarthy and the rest of the Green Bay Rubicons.... The Packers didn't want him anymore." This past Sunday, ESPN’s Keyshawn Johnson had a long video piece about how revenge will serve Farve well—just like it did for him—and that Farve should play with revenge in his heart. Greg Doyle of CBS Sportsline wrote that "Farve proved critics wrong" and claims that the Packers "set this whole thing in motion when (in 2005) they invested in the franchise's future" and not the present. "From friend to friend that I think he will retire. That's my opinion. My opinion is that I think he will. If he doesn't, he knows I want to play with him the rest of my career. It's up to him. He still makes the final decision. I think every guy in that locker room may think, 'Well, Brett may hang it up this year.' No one knows. The only one who knows is Brett Favre and once he makes that decision, he'll make it," Driver said. After much speculation, Farve finally announced his decision to return on March 10, 2005, for one more year. In fact, "The Brett Farve Will He-Won't He Retirement Parade" began a couple of years before, with Farve hemming and hawing each spring about whether he would play or not. But by 2005, the Packers felt that Farve had given enough signals that taking a QB in the first round was a prudent thing to do. And that seemed to be the beginning of the Farve resentment towards Green Bay management. Farve ignored Rodgers completely, neither tutoring him, nor even addressing him. He resented the fact that Rodgers was even there, a reminder that his role, his time as Lord Farve would eventually be over. Farve wanted it both ways; to retire, or at least threaten to, then to come back—and be accepted, no questions asked. The Prodigal Farve. Remember, no one ever said he couldn't still play; Thompson and McCarthy tried to convince him NOT to retire in 2008. They wanted him back; he said no. And yet, for some reason, after all the contradictions and outright lies Brett Farve has delivered—on record—the media still treat him like royalty. And celebrate last night as some sort of vindication. So, at the end of the day, what was the Packers’ huge crime that Farve—and many a sports journalist and broadcaster—felt he had to get revenge for? For believing Farve was retired? For moving on as an organization? For finally accepting that he was gone after years of being held hostage and teased. For not rolling out a giant red carpet, shoving Rodgers out of the way—even though he'd been practicing for months—and supplicating themselves in front of Lord Farve, thanking his Blessed Munificence that he had deigned to play for them again? Apparently so. And for remembering what actually took place, Farve had to take his revenge. great column : just remember he grew up in mississippi and the man's not down until they prey the football from his cold hands.